Time required:20-45 minutes, three to six days per week for four weeks. Research suggests that people who practice the body scan for longer reap more benefits from this practice. Especially for those new to the body scan, we recommend performing this practice with the audio. However, you can also use the script below for guidance for yourself or for leading this practice for others. Begin by bringing your attention into your body. You can close your eyes if that’s comfortable for you. You can notice your body seated wherever you’re seated, feeling the weight of your body on the chair, on the floor. And as you take a deep breath, bring in more oxygen enlivening the body. And as you exhale, have a sense of relaxing more deeply. You can notice your feet on the floor, notice the sensations of your feet touching the floor. The weight and pressure, vibration, heat. You can notice your legs against the chair, pressure, pulsing, heaviness, lightness. Notice your back against the chair. Bring your attention into your stomach area. If your stomach is tense or tight, let it soften. Take a breath. Notice your hands. Are your hands tense or tight. See if you can allow them to soften. Notice your arms. Feel any sensation in your arms. Let your shoulders be soft. Notice your neck and throat. Let them be soft. Relax. Soften your jaw. Let your face and facial muscles be soft. Then notice your whole body present. Take one more breath. Be aware of your whole body as best you can. Take a breath. And then when you’re ready, you can open your eyes. * You can also listen to a 45-minute version of the Body Scan that the UC San Diego Center for Mindfulness uses in its trainings in Mindfulness-Based Stress Reduction. This article was adapted from Greater Good In Action, a site launched by UC Berkeley’s Greater Good Science Center, in collaboration with HopeLab. Synthesizing hundreds of scientific studies, Greater Good in Action collects the best research-based methods for a happier, more meaningful life—and puts them at your fingertips in a format that’s easy to navigate and digest. 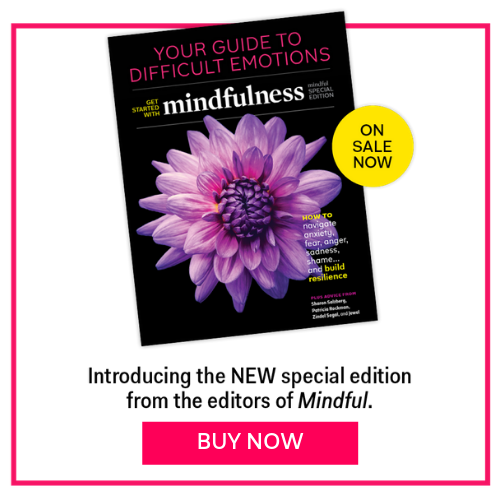 The meditation is narrated by Diana Winston, Director of Mindfulness Education at UCLA Semel Institute’s Mindful Awareness Research Center (MARC). Greater Good In Action is a site launched by UC Berkeley’s Greater Good Science Center, in collaboration with HopeLab. Synthesizing hundreds of scientific studies, Greater Good in Action collects the best research-based methods for a happier, more meaningful life—and puts them at your fingertips in a format that’s easy to navigate and digest.